Overview - Friends of Borneo. Keeping it wild! The UNEP reports an alarming trend towards extinction for the Borneo orangutan. If nothing is done, by the year 2020, only a small population will be left from the hundreds of thousands that roamed Borneo island a few decades ago. Our goal is a simple one, we have identified north Borneo as the best location to create a safe haven, an ark if you will, for small remaining populations of Borneo's endemic wildlife. We will do this with local organisations and NGOs that have worked for years on protecting its wildlife. Projects will include reforestations of known habitats, the connection of protected forests for long term survival and the enforcement of local and national wildlife laws. Figure 1: Bornean orangutan distribution, with priority populations highlighted. Reproduced from Caldecott & Miles (2005); updated with GRASP priority populations. Sources: Ancrenaz & Lackman-Ancrenaz (2004); Meijaard et al. (forthcoming); Meijaard et al. (2004); Singleton et al. (2004). Degree of human impact. 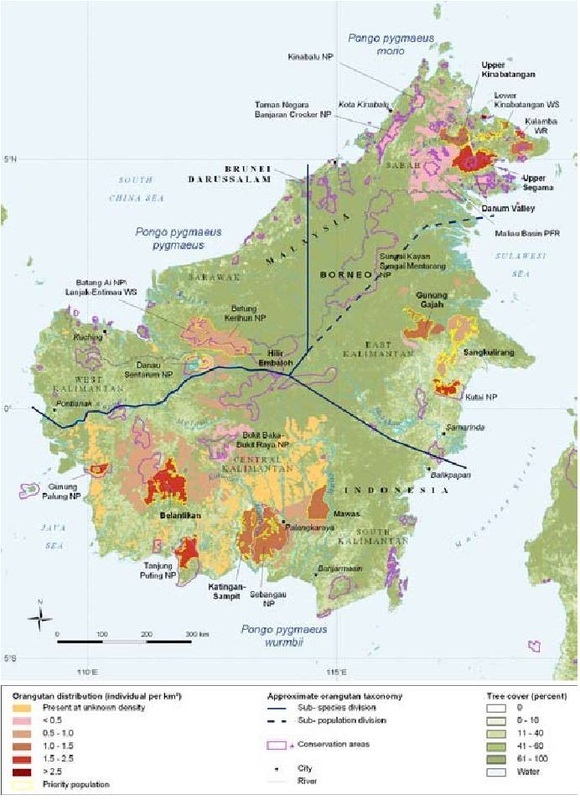 Green areas in Borneo and Sumatra indicate remaining undesturbed areas, while black-to yellow indicate loss, an estimated 98% by 2022, mainly due to oil palm plantation development and illegal logging in protected areas. Borneo is the third largest island in the world and is divided among three countries of Malaysia, Indonesia and Brunei. Most of the island is Indonesian territory with the Malaysian states of Sabah and Sarawak occupying about 26% of the island. The sovereign state of Brunei, located on the north coast, makes up about 1% of Borneo's land area. At 130 million years in the making, Borneo is home to one of the oldest rainforests in the world. The past few decades have seen a rapid rate of deforestation in both Malaysian states and on the Indonesian side of the island. 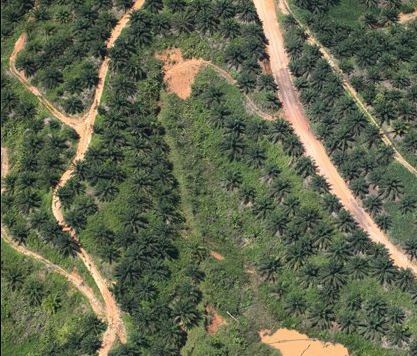 Timber and palm oil have been the main drivers behind the deforestation, creating a hostile environment for Borneo's endemic animals including the iconic orangutan. As a group of people looking to make a personal difference for wild Borneo, Friends of Borneo works with local groups in Sabah, Sarawak and Indonesia to reclaim and reforest. We believe that every individual that wants to save a bit of the forests and Borneo's endemic wildlife including the orangutan, should have the chance to engage directly and personally with the communities in Borneo that can make this happen.